Although, at times, we've been sadly beyond satire. Time now to concentrate on the football, to celebrate the game's rich heritage with the first Scottish Cup semi final today. Concentrate as much as possible anyway, doing our best to ignore that our most venerable cup competition is without a sponsor. And doing our best to ignore the empty seats. The odd diktat that all Scottish Cup semi finals must be played at Hampden - while allowing two TV companies to show it live - will mean a ground that is less than a fifth full, carrying with it all the allure of ninety minutes spent in a wind tunnel. The laughing stock of the world? Aye right. There's not even enough people here who care. All of which is a shame. A shame because the loss of magic on Scottish Cup semi finals weekend is indicative of the loss of magic throughout Scottish football. And a shame because for Motherwell and St Johnstone this is a huge, huge game carrying the tantalising prospect of a cup final and European football. They arrive at Hampden tomorrow on the back of different seasons. Motherwell's campaign kicked off on the 15th of July last year with a European qualifying game. Since then they've lost a manager in Craig Brown, found a manager in Stuart McCall, lost form, given up any pretence of consistency, lost a final and now, suddenly, clicked. Their recent run has included putting to an end to Dundee United's cup pretensions and excellent run of league form. In their last game they emerged from Tynecastle with a draw. Along the way they've confirmed their place in the top six and won plaudits for their reinvigorated approach. Compare and contrast. St Johnstone might not have fully succumbed to the cliche of a difficult second season. But it's hardly been one of unadulterated joy. Although never looking likely to drop out of the league this has been a year of frustration. A lack of goals has hamstrung them. They remain more than capable of holding their own. But they do so with a butter knife of a cutting edge. Only Hamilton in the league and Partick Thistle and Brechin - at the second attempt - have been beaten since the start of February. The Colin Samuel strike that finally saw off Brechin was their only goal in the last six games. That goals are the big problem for Derek McInnes is shown by the league table. Their 18 goals mean they share with Hamilton the distinction of being the SPL's lowest scorers. Yet they're a full 18 points clear of the bottom side. St Johnstone have plenty to offer the league. But at the moment they're too impotent to make their other strenghts count. All of which must make Motherwell favourites today. But semi finals have been known to shock us. Hampden's atmosphere is often odd, the wide open spaces will make it positively eery this afternoon. The pitch is taking a lot of criticism although both these clubs can lay claim to recent experience on decidedly dodgy surfaces. It could be a strange old affair. And maybe that will suit St Johnstone as they strive towards a first ever Scottish Cup final. Prediction: If St Johnstone can contain and frustrate early on then it could be very tight. Motherwell in the 90 minutes. St Johnstone if it goes beyond that. Just when we thought we'd had controversy enough this week, up pop UEFA again. The governing body of European football have now indicated that far from content with threatening to sanction Rangers over their fans behaviour in their away game against PSV Eindhoven they also want a pound of meat over the behaviour of fans at the home game. Martin Bain is astounded. And, manna from heaven this for the internet conspirators, has indicated that favourable reports from UEFA's delegates have been ignored in favour of reports from FARE - Football Against Racism in Europe. Let's leave aside the default descent into victim status that is an increasing blight on modern society. What is Bain actually saying here? "It's a problem we admit that. But it's big bullies coming along and pointing out that it's a problem that is the real problem." UEFA also need to clarify the role of outside or partner organisations. But that is not Bain's problem right now. The way Bain's reaction will be seen is of the club - backed by the conspiracies flooding the internet - trying to silence not the bigots but an agency set up to tackle bigotry. That is not something Rangers should feel comfortable with. There is, I foresee, going to be a problem with UEFA's consistency in excercising this new hardline attitude across the continent. Again though that's a problem UEFA themselves will need to address not Martin Bain. But, again, "what about..." is not an excuse. In fact it's becoming the scourge of Scottish football where the natural reaction is not to accept blame and solve problems but to find somebody whose crimes are worse or comparable to your own. As for Bain's claim that the club "could not have done more" to stamp out this behaviour? Fair enough. If that's what he truly believes then he's entitled to his opinion. But UEFA are also within their rights to disagree and sanction the club if they think they have failed. The clearest message Bain could send out, the ultimate proof that "the club could not have done more" would be to take the punishment on the chin and then lay the blame at the feet of those fans who have arrogantly refused to moderate their behaviour. > I write this with blood on my hands after my own brush with sectarianism earlier today. Please allow me to indulge in a spot of navel gazing. "Rumours that Gary O'Connor has been invited to train with huns." My immediate reaction was "blimey, that's interesting." Without giving it any more thought I re-tweeted. I've been talking about O'Connor quite a lot since he was released by Barnsley. I've followed his career closely both because I saw him come through the ranks at Hibs and because he was a couple of years below me at school. So I retweeted the original message. "@ScotFootBlog Why retweet a message containing a sectarian slur? Disappointing." I actually had to check what retweet it referred to. When I realised I immediately unretweeted and apologised. Was I, by spreading that one sentence, unmasking my own sectarianism? The truth actually is I barely noticed the tweet beyond the O'Connor reference. Perhaps it was because I had just woken up, perhaps it's because 25 years of following Scottish football has left me immune to such language. I'm certainly not sectarian. If we are to take a religous view of sectarianism then I don't have much time for any religion and absolutely no ill will towards anyone who does. I suppose, and this must have been the inference, I was being accused of sectarianism towards Protestants. In which case I was being bigoted towards the church I was christened in and brought up in. Maybe I'm a case for a Freudian therapist. Is the use of the word "hun" sectarian in any event? Maybe there is a legal precedent. Certainly dictionary definitions don't seem to refer to it. The etymology of the word is hardly conclusive. Its widespread usage in Britain during the wars was derogatory towards Germans so it is clearly a slur. But even then it was introduced as a description of the German army by their own kaiser. Further back, of course, the word refers to Attila the Hun. Clearly that's not a positive association but Attila's religion seems unclear. It was perhaps an amalgam of "shamanism, animism, totemism and ancestor worship" called tengriism, a creed that carries little association with Scottish football. None of that is really the point. Because it is clear that during its association with Scottish football the word has derived meanings that go beyond traditional etymology. In this debate context is all. Perhaps I am protesting too much but I present this mea culpa for a couple of reasons. One, I think it illustrates the atmosphere surrounding our game at the moment. Even being innocently unthinking I was causing offence. The Rangers fan who took me to task was reasonable and accepted my apology. Others, I fear, would have used it with a stick to beat me over a non existent sympathy for Celtic. And also because I was in the wrong and I deleted the tweet and apologised. This isn't language I normally use so it shouldn't be language I'm prepared to even absent mindedly or thoughtlessly endorse in others. The point of this blog and accompanying Tweets is not to offend. Unless you're an employee of the SFA, SPL. Or a politician. Or John Hughes. Or, in the interests of full disclosure, Ronnie Corbett. Could I have argued against the technicality of sectarianism? I could have. But Scottish football is going round in circles arguing about definitions of sectarianism. Sometimes we just have to accept we're in the wrong. Could I have stated my own right to freedom of speech? I could have. Others do to the point of obsession. But freedom of speech as it is commonly defined, my vague recollections of first year politics suggest this has at least been the case since John Stuart Mill's On Liberty in 1869, carries with it limitations. In this case I'd mistakenly, ignorantly, foolishly or whatever used a word that obviously caused someone else offence. In deference to that I made amends. That was hardly a stinging denial of my own freedoms. A tiny, miniscule, inconsequential example of course. But is that not all we're asking fans who shout and scream and sing slogans and songs that cause offence to do? To show some respect to the feelings of others? Anyway, chest fully cleared I'm off to teach the world to sing. In perfect harmony. Zico takes centre stage today. 23rd of May 2002. Scotland, without a win that calendar year, were in Hong Kong playing in the Reunification Cup to mark the fifth anniversary of Hong Kong's reunification with China. Scotland were to play the hosts in the second of their two games in the four team tournament. Three days earlier they had lost 2-0 to South Africa to continue an abject run of form under Berti Vogts. On the day Hong Kong fielded a representative side drawn from their league although the SFA decreed that this game should be treated as a full international. Which proved to be good news for the Scottish Football Blog's third forgetten Scotland player, whose appearance won him his sole cap. Hong Kong offered little resistance to a Scotland side driven, the SFA website recounts, by the midfield duo of Christian Dailly and Scott Gemmill. Dailly and Gemmill both scored in the second half. But it was the first half advantage provided by goals from Sunderland's Kevin Kyle and Dundee United's Steven Thompson that gave Vogts the cushion he needed to blood his latest youngster. At half time Maurice Ross was withdrawn and replaced by 21 year old Aberdonian Warren Cummings. This was an example of Vogts' commitment (an admirable if not always winning commitment) to unearthing young players and hidden talents for Scotland. At the time Cummings was a Chelsea player although he was never to make a senior appearance for the London club. In the two years before his Scotland cap he'd played ten league games on loan at Bournemouth and made 19 appearances over two loan spells at West Brom - a dozen of them as a substitute. His most recent spell at West Brom had allowed him to make some cameo appearances as the club won promotion to the Premier League. But that was the closest he had come to top flight football before Vogts took the decision to fast track him into the Scotland team. "Chelsea's young left back Warren Cummings was given his debut." Cummings probably didn't care. He was 21, contracted to Chelsea and had just made a winning start to his international career. Unfortunately on his return from Asia things didn't quite progress as he might have liked. The 2002/03 season started with two loan spells and only eight starts at Dundee United. 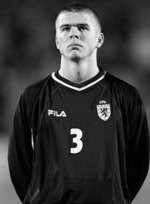 In January 2003 Cummings made the loan move that would come to define his career. Chelsea farmed him out to Bournemouth for the second time and he'd made 16 league starts by April of the same year. Impressed with what they saw Bournemouth made the deal permanent that season as they enjoyed promotion from the Football League Third Division. And Warren Cummings has served them loyally - perhaps an issue or two over pay aside - ever since. Over 200 first team appearances have followed and in February of this year, although no longer a guaranteed starter, he was made club captain. Along the way there have been rough times. Financial fun and games and a points deduction meant they flirted with dropping out of the Football League altogether before winning their final home game of the 2008/09 season to guarantee their league status. Things have looked up since then and in 2009/10 Cummings enjoyed his second promotion with the Cherries as they finished runners up in League Two. And he might not be finished there. As club captain he could yet be enjoying a Wembley glory day as Bournemouth hover around this season's play off spots. Ten seasons after his walk on part in West Brom's successful promotion season - the season that gave him the platform to play for Scotland - Cummings could find himself back in the Championship next season. A solid career then. But one that began with a cap for Scotland. Warren Cummings was plucked from obscurity by Berti Vogts for 45 minutes of international football. For most of the Tartan Army I guess he returned to that obscurity pretty quickly. "I've seen players called up who aren't playing every week for their club." "It disappoints me to be honest to see players playing reserve team football and getting in ahead, of not necessarily me, but payers playing first team football." "Other players are playing at higher clubs, but that doesn't mean they are better." "I just try to forget about it to be honest and take it with a pinch of salt. If I ever did get called up though I'd be very happy and would want to play." "I'd be absolutely delighted because I'm a patriotic man. If I don't I'd never lose any sleep because I don't really see it happening." "I wouldn't say I'm a victim of playing in the lower divisions, but I doubt Berti Vogts would take time to come to Bournemouth and see me." "I don't know if he thinks the standard isn't good enough, but I've played up in Scotland and I think Bournemouth are as good as anyone outside Rangers and Celtic." A hint of bitterness. But it must be countered that Vogts hardly picked Cummings on the basis of a sustained run of form in 2002. Still one cap and a 4-0 win gives Cummings a 100 percent record for Scotland. That's more than can be said of Berti. > Because of Hong Kong's lack of a national side at that time there were some oddities in Scotland's 4-0 win. Not least that the Scots beat a team captained by a Scotsman. Former Dundee midfielder Gary McKeown had the honour of the armband for the Hong Kong side that day. Scotland, for the record, finished second in the tournament behind South Africa and ahead of Hong Kong and Turkey. This evening, as Scottish football continued the season's strange trend towards self immolation, Falkirk were beating Partick Thistle at Firhill. Not massively remarkable in itself. But a welcome break for Falkirk fans in a season of growing worry. On the pitch there's a common belief that Steven Pressley is not the right man for the manager's job. Again that's not remarkable. Winning over hearts and minds in Falkirk is not easy, they're an unforgiving bunch. More worrying than Pressley's continued presence is the news that Falkirk are skint. Potless. At a fans meeting last night assurances were given that there is not any threat of administration, that neither the bank nor the taxman were due any outstanding amounts. But there is a cash flow problem. One, Falkirk forums are suggesting, so severe that season ticket sales for next season are the only reliable way the club have of clambering to the relative safety of summer. At which point players can be jettisoned, the wage bill cut and belts tightened to the point of corsetry. Which is a hand to mouth existence. An existence that depends on the continued faith of fans who have been let down by their board before. And an existence that seems to offer those fans only survival rather than the promotion push they want. So it's a business plan but it doesn't look like the most watertight of strategies. Perhaps the board's apparent confidence is well placed, a readjustment to new financial constraints will prove this to be no more than a blip. But right now Falkirk look part of the ever growing list of Scottish football clubs that can make no claim on being sustainable businesses. When the board is unpopular, when the manager is disliked and the squad is about to be asset stripped, relying on the continued faith of the fans is precarious. As Scottish football is dragged towards civil war we're in danger of forgetting that large chunks of our game appear to be bankrupt. As our arguments become ever more vituperative we risk ignoring that the SPL's Neil Doncaster is the only person to have articulated a strategy for saving the game. And, sadly, his is a plan that looks as flimsy as Falkirk's plea to keep calm and carry on. We have our first league champions of the season. Congratulations to Livingston on securing the Second Division title yesterday with a 3-0 win at Stenhousemuir. 21 points clear of Brechin, Livingston have dominated the league this season. And now they've got their reward. Successive promotions have taken them back to the First Division, just two seasons after they were dumped into the Third Division by the Scottish Football League. Livingston had erred and the SFL were within their rights to take action. But the league's own inconsistency in dealing with such situations left a bitter taste for many. That will have made last night's champagne taste all the sweeter. Rumours of a new stadium will add to the sense of excitement. And surely dreams of an SPL promotion are already invading some peaceful slumbers in West Lothian. Three promotions in three seasons is a hell of an ask. It would be a remarkable story though, not least because it would mean Livingston travelling from bottom to top flight twice since 1995. All that's in the future. Time now to savour the win. And, no doubt, survive the hangover. It might fly a little under the radar but today's Alba Challenge Cup final is surely a welcome distraction for Ross County and Queen of the South. County are being tracked by Cowdenbeath at the bottom of the First Division, an unwelcome relegation play-off still a distinct possibility. “Things are a total nightmare. Almost every single first team player has been approached by another club between December and now. “These players are out of a job in the next two months. I have told them to look after themselves and take an offer if they get it. They have kids and mortgages to think about. All of which makes Brannigan's achievement in taking Queens to fourth in the First Division, with third place not out of reach, all the more admirable. Understandably both Brannigan and Ross County manager Jimmy Calderwood have painted today as a break from the tribulations of the season. This is a cup final football as a footballing stress ball. Let's hope that the manager's can convey that to their players, allowing them the sense of freedom that will reward beleaguered fans with a game worthy of a national cup final. They might, unfortunately, not get a huge amount of help from the pitch. McDiarmid Park has been the victim of some harsh conditions since this game was originally snowed off in November. It's showing the strain. League positions suggest Queen of the South are favourites. The three clashes so far this season confirm that with the Dumfries' biblical superstars enjoying two wins and a draw in three league games. But a cup final win might go some way to convincing the doubters that Calderwood is the right man to steer Ross County through troubled waters towards the end of the season. And a trophy would be lend much articulacy to the fight to secure a viable future for Queen of the South. People might not take much notice of it. But both sides have more than just a trophy to play for today.